The best counterexample to use is the murder of Orlando Figuera. 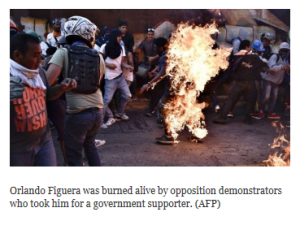 Reuters, like all the international corporate media, is quite biased against the Maduro government and its supporters (who are called “chavsitas” after the late President Hugo Chavez), but it could not deny that opposition protesters murdered Figuera. Here and here are Reuters articles that reported Figuera’s murder. He was stabbed and then burned alive. 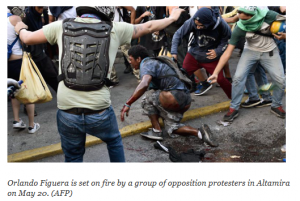 The only thing Reuters disputed was whether Figuera, who was black, was murdered by the protesters for being a suspected thief or for being a suspected chavista. From his hospital bed shortly before he died, Figuera said he was attacked for being a suspected chavista. Did the UN’s “remote” investigators not have access to the Reuters website? This ridiculous statement by the UN shouldn’t surprise us when we consider the UN’s monstrous track record in both Iraq and Haiti. The UN is large and diverse body, so it can sometimes push back a bit against the US government but in general it can be relied on to collaborate with major crimes, even if not quite as often and enthusiastically as far right neocons and fanatical “supporters of Israel” would like.